In terms of the planning that goes into this kind of visit, you obviously need to know the details of when they’re arriving and departing. It’s also helpful to know any special beverages or foods that someone likes having in the house. Beyond that, what planning entails will depend on your specific guests. There are a number of reasons why someone may not like dogs. Common examples include fear or being allergic. By taking the time to understand why someone feels this way, you may be able to find specific solutions that help the situation. For example, demonstrating how nice your dog is to a visitor who’s scared of dogs without pressuring them to directly interact can help change the negative association they currently have. 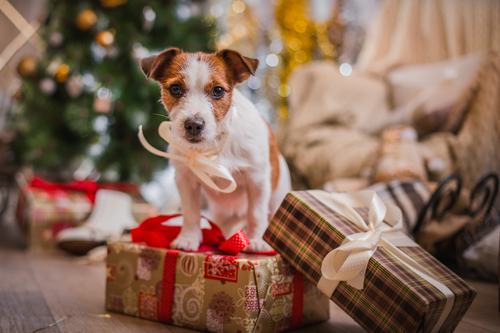 Even though your dog may rule your house during most of the year, it’s a good idea to create a comfortable space so your dog won’t be on top of visitors. This is also helpful if you have any concerns about your dog getting stressed or anxious about the increased activity that goes along with having visitors in your home. What If It’s Your Dog Who Doesn’t Like Visitors? By understanding exactly why visitors don’t like dogs and creating the right space for your dog, you can successfully manage visitors who aren’t crazy about dogs. But what if it’s actually your dog who doesn’t like visitors? In addition to following the tip about creating the right space for your pet, we have two other proven strategies. First, be sure to exercise your dog plenty while visitors are in your house. This will help your dog maintain an even temperament. And second, our calming balm is the perfect way to help your dog manage any stress it may experience as a result of visitors being in the house.